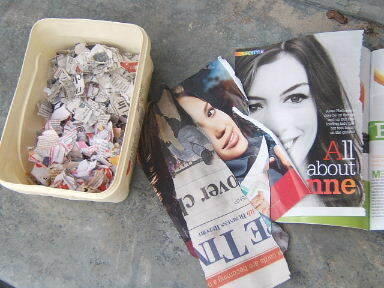 I always thought making recycled paper was an enormous task - too much effort for me. 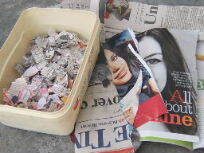 making recycled paper is not that difficult at all. 2 X wooden boards; 2 X square pieces of blanket material or nappy towelling material, slightly larger than your paper mould;31 square pieces of cotton material, slightly larger than your paper mould. Making recycled paper pulp: Tear a mixture of approximately fifty A4 size sheets of newspaper and magazine paper into tiny pieces. Soak this overnight in cold water. Take a handful of paper and add it to a blender. Fill the blender to the three quarter mark and blend it to a creamy pulp - until it has a sauce like consistency with no lumps. You can add more water if you need to. Three quarter fill the plastic basin with water. Add 3 jugs of pulp and the gelatine sizing mixture. If you plan to paint or write on your paper, then you need to add a sizing mixture to it, which will make the paper less absorbent. Dissolve 20 ml of Gelatine in 1 litre of boiling water, stir well and add this to your recycled paper pulp. Prepare your paper press: lay down the wooden board, followed by the square piece of blanket and a damp square cotton sheet. Collect your paper pulp with your paper mould. Remove the frame and gently lower it onto the damp cotton sheet. 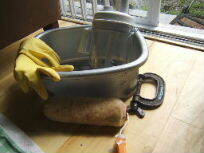 Flick the sieve with your fingers to loosen the paper and lift the mould. damp cloth, paper, damp cloth, paper etc. Cover the last sheet of paper with a damp cotton sheet, followed by a square piece of blanket material and the second wooden board. 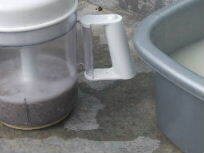 The action for collecting the pulp on the sieve is very important. If it is not lowered and lifted smoothly, the pulp will settle unevenly. 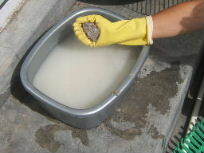 The frame and sieve must be held firmly and lowered from a vertical position over the basin to a horizontal position underneath the water's surface. Hold the mould at a slight angle as it breaks through the surface into the pulp mix, and then straighten it as you lift it up and out of the pulp. 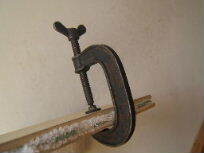 Tighten all the sheets by attaching wood clamps to the sides. Tilt the boards so that all the excess water can drain away. Remove the clamps and carefully remove each sheet as the paper will stick to the cotton sheets. Place each sheet carefully on a flat glass or wood surface and flatten each sheet by rolling it with a paint roller. 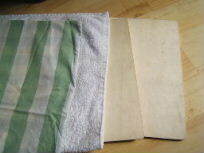 Now carefully peel the paper off the cotton sheet and leave the paper sheets to dry for 24 hours. To give your paper a bit more "character" you can add colourful cotton thread, food colouring, shredded coloured magazine paper or dried flowers to the pulp in the basin. 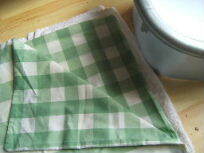 To whiten your homemade paper add about half a cup of white vinegar to your pulp mixture in the basin. Buy a packet of pretty envelopes, to match your homemade paper and give this to a friend with 10 sheets of your recycled paper, rolled up and tied together with a pretty ribbon. Another frugal gift idea is to use your recycled paper to make a special birthday or Christmas card. I love scrapbooking, when I have the time, and I use my scrapbooking bits as well as the pictures from leftover wrapping paper and even old greeting cards. For more ideas on homemade gifts, please visit my Frugal Gifts page on this website.